Instagram today rolled out a new style for sharing ephemeral messages with others. Disappearing photos and videos are still shared via the Direct messaging tool, but moving forward they are included within ongoing threaded conversations between people or groups, rather than pulled out separately. 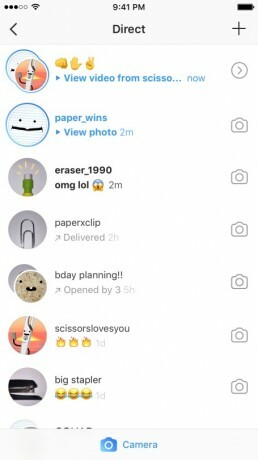 Instagram features a new blue camera icon in the Direct messaging feature for capturing disappearing photos or videos. The blue camera icon is also available within individual message threads. An arrow button lets people select the friends or groups with whom they'd like to share, and a new function lets users keep track of who's viewed disappearing messages. Instagram has retooled notifications, too, so disappearing messages will be called out thanks to new blue highlighting. Disappearing messages can be replayed once, and the sender will be notified if the message is played twice and/or captured via screenshot. The new Direct messaging feature is rolling out to Instagram for Android and iOS devices this week. Facebook today said it is exploring new features for Facebook Messenger that will give people the ability to secure their conversations. First, Facebook is looking at end-to-end encryption between two devices.